Katharine Hepburn Studio Portrait ca. 1941. As a resident of Los Angeles, I pass by that famous white Hollywood sign every time I go for a hike or make a run to the grocery store. Living in the middle of Tinseltown can make one feel somewhat jaded, particularly when Oscar season rolls around. In my neck of the woods, the Academy Awards ceremony means helicopters flying overhead day and night, incessant local news coverage and traffic jams. Cynical as I might feel about the fanfare, I always watch the Oscars, and I always get a little flutter inside when the ceremony begins. There is something magical about the movies… a dark theater, the smell of popcorn, the music of a beautiful soundtrack sending shivers through your core. I love the experience of watching a movie. Unfortunately, the majority of films today fail to move or excite me. If I could, I’d travel back in time to the “good old days,” when movie stars kept it classy and talent was the name of the game. 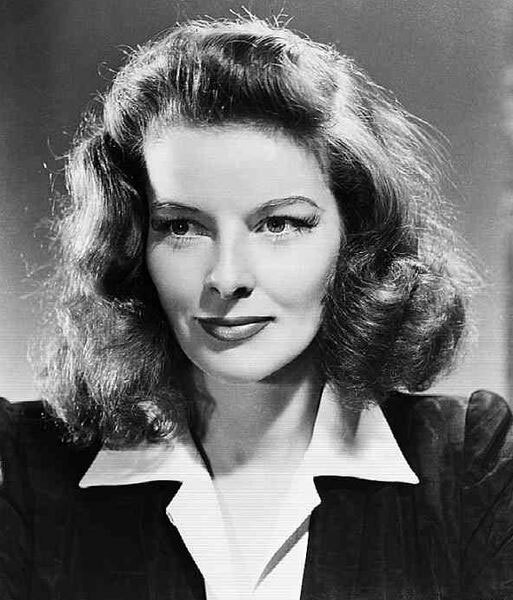 I’m talking about old Hollywood, the silver screen, and the days of Katharine Hepburn. Katharine is currently the record holder for the most Leading Actress Oscar awards (4 to be exact). She was beautiful. She was smart. She was unafraid to express her opinion. All this, and the woman knew how to make killer chocolate brownies. They broke the mold with Katharine Hepburn. Born on May 12, 1907 to a freethinking family, Katharine’s parents encouraged her to speak her mind and embrace her independence. Her mother, Katharine Marie Houghton, fought for women’s rights as a suffragette and her father, Dr. Thomas Norval Hepburn, was one of the first to begin educating the public on sexual health and safety. Thanks to her upbringing, Katharine was very aware of social issues. In fact, one of her first acting performances was given in the spirit of charity. As a child, she and her 5 siblings put on a neighborhood performance. They sent the profits to benefit Navajo children living in New Mexico. Upon graduating from Bryn Mawr College in 1928, Katherine immediately embarked on her journey into an acting career. She received rave reviews for her role on Broadway as an Amazon queen in The Warrior’s Husband, which caught the attention of a scout from RKO Radio Pictures. In 1932, Katharine starred in her first big screen role opposite John Barrymore in A Bill of Divorcement. RKO, pleased with the reviews of her performance, offered her a long-term studio contract. Katharine’s career was on an upward trajectory; the following year, she won her first Oscar award for her role in the film Morning Glory. Katharine’s upbringing helped to shape some of her most memorable qualities as an actress. In particular, Katharine was admired for her confidence, intelligence, and unwillingness to conform to Hollywood stereotypes. She didn’t feel it was necessary to wear makeup; she often wore pants instead of the feminine dresses that were considered more “suitable” at the time. At one point, studio executives became dismayed by Katharine’s somewhat masculine attire. They ordered a member of RKO’s costume department to remove a pair of pants from her dressing room. Katharine stomped around set in her underwear to protest. 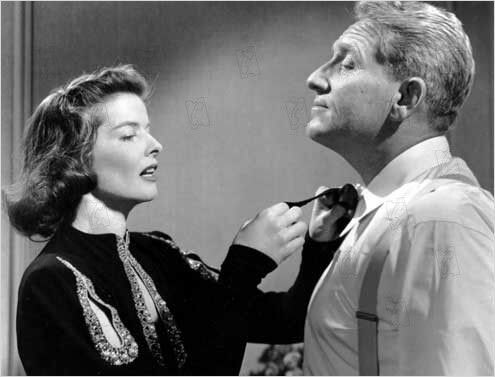 Katharine Hepburn and Spencer Tracey in State of the Union. Katharine’s career spanned over 50 years, both on screen and stage. In addition to her 4 Oscar wins, she received 8 additional Academy Award nominations. 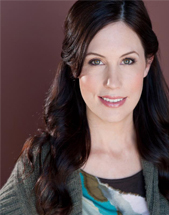 She also won an Emmy for her role in the television film Love Among the Ruins. Her career was marked by a long-term love affair, both onscreen and off, with actor Spencer Tracey (another Oscar record holder, tied with Laurence Olivier, for most nominations in the Leading Actor category). Katharine and Spencer starred in 9 films together. Though they never wed, their relationship lasted 27 years until his death in 1967. Katharine’s last film with Spencer was Guess Who’s Coming to Dinner; the role won her a second Oscar. She later won a third and fourth Oscar for The Lion in Winter and On Golden Pond. At the age of 96, Katherine passed away in the same Connecticut house where she grew up. Though she may no longer be with us, her film legacy will certainly outlive us all. In honor of Katherine, I recently decided to try out her recipe for brownies. You may gasp when you read the ingredients: lots of butter, lots of sugar, and only a tiny bit of flour. This lack of flour was apparently Katharine’s secret to great brownies. The recipe comes from a letter to the editor of the New York Times on July 6, 2003. In the letter, Hepburn’s New York neighbor Heather Henderson recalled her first memorable meeting with Katharine. At the time, Heather was threatening to quit her studies at Bryn Mawr, Katharine’s alma mater. Heather’s father, who had noticed that Katharine lived nearby, slipped a letter into her mail slot, begging her to talk some sense into his daughter. Katharine called Heather at 7:30am the next morning and lectured her on the stupidity of her decision. The two arranged to meet for tea. Katharine convinced Heather to stick it out at Bryn Mawr. This began a series of casual meetings between Katharine and the Henderson family. One day, Heather’s father heard that Katharine had been in a car accident and was recovering. He stopped by her place to bring her a batch of brownies. Hepburn tasted them and balked. “Too much flour! And don’t overbake them! They should be moist, not cakey!” As always, Katharine was opinionated and brutally honest. She rattled off her own brownie recipe while Heather’s father scribbled notes. The recipe appears below, with a few of my own notes in the baking instructions. 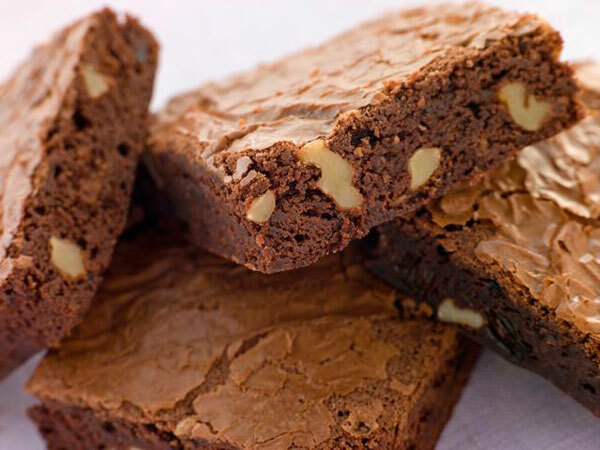 I made these brownies twice over the weekend, and they are wonderfully rich and gooey. I tried the first batch with cocoa (from the original recipe), and the second with baker’s chocolate. I preferred the brownies made with melted chocolate, though both batches were good. In my oven they took about 45 minutes; as Katharine said, you should make sure you don’t overbake them, or they’ll get dry. I may use a little less sugar next time, and half the nuts, but these are personal preferences. Enjoy this simple and sweet treat in honor of Katharine Hepburn and her impressive Oscar legacy. Bryson, John. The Private World of Katharine Hepburn. Boston: Little, Brown, 1990. Druesedow, Jean (Author), MacDonell, Nancy (contributor). Katharine Hepburn: Rebel Chic. New York: Skira Rizzoli, 2012. Henderson, Heather. “Straight Talk from Miss Hepburn, Plus the Actress’s Own Brownie Recipe.” New York Times, 6 July 2004. Hepburn, Katharine. Me: Stories of My Life. New York: Knopf, 1971.